As promised, here is a picture of how capitalist economies, like ours, work over a long period of time. “GDP” stands for Gross Domestic Product, which is the common way of measuring how much total wealth national economies like ours produces over the course of a year. 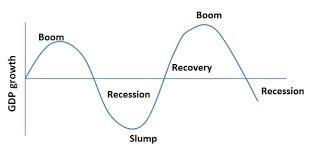 All capitalist economies go through “cycles” of growth (“boom” economies) and decline (“recessions” or “slumps” or “busts”). If you are a few decades old, you’ve seen this happen more than once. For a few years, the economy grows, it’s easy to find a job, wages rise, and companies make good profits. When things are going well, we expect that to continue,and we take more chances on borrowing and spending, and sometimes we get in over our heads. Then something happens. People and businesses realize they have to repay all the money they borrowed, and when they buy new items, they notice that prices have (usually) gone up as well during the “boom.” At some point, businesses and consumers (the “private sector”) start borrowing less and cut back their spending. As more and more spenders cut back, there is an economic effect like a snowball growing as it rolls downhill. Consumers buy less, so businesses lay off production workers, then those laid-off workers buy even less, so businesses invest less, and so on. Unemployment, low wages, low investment and low profits spread through the whole economy. Some businesses close, some laid-off workers can’t pay their mortgages, some face foreclosure, and so on. The economy is in recession. 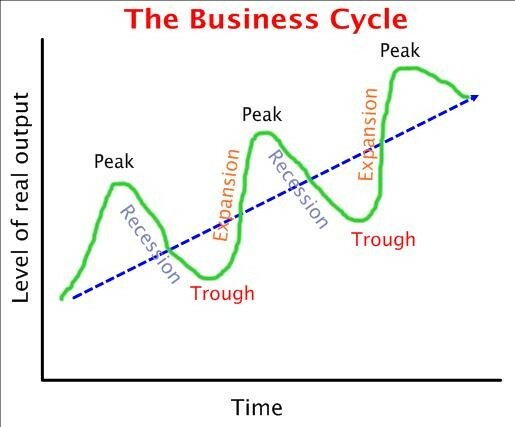 Eventually, after a couple or a few hard years, most debts are paid down, bankruptcies are settled, people start to buy again, companies start hiring, and the “cycle” repeats. This has been happening for the past two hundred years in all capitalist economies, so we may as well get used to it, and plan accordingly. Most people and most businesses, of course, would prefer steady and predictable growth. This is where the national government can step in and make a difference. Smart governments (beginning with the Roosevelt Administration in the U.S.) have learned to spend less (or at least run smaller deficits) when private businesses and individuals are spending more – and then spend more (hiring workers directly, or paying higher unemployment benefits, and so on) when the private sector slows down. Chart above shows how government spending (green line) SHOULD move in OPPOSITE direction from economic growth (black line). When the private economy is “booming,” government spending or deficits fall; and when the private sector is in recession, government spending partly makes up for that by spending MORE. Overall, economic production stays closer to the straight line in the center, with fewer and smaller ups and downs. In modern terms, government should STIMULATE the economy in hard times, and consider some AUSTERITY when the economy is growing fast and prices are rising. 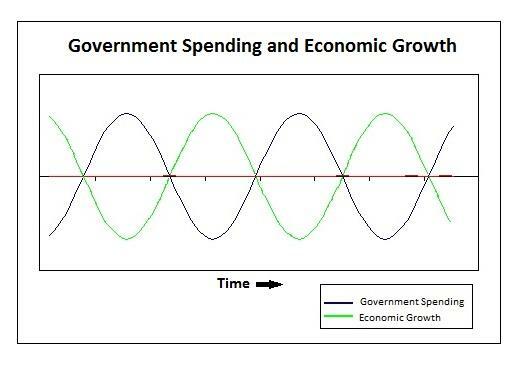 This is called “counter-cyclical” government spending, because government spending goes in the opposite direction of the “private sector” – it counters that spending cycle. A question many people ask is why is it that a national government can spend more when it is collecting less in taxes? This is the opposite of what most of us must do, and it seems contrary to “common sense”. But national governments are unique, all over the world, because they can actually create money and wealth, up to a point. That is one of their indispensable roles – printing money. They are NOT like individuals. “Common sense” comparisons of governments and individuals are just wrong, as history has proved over and over. Finally, here is a picture of what should result when government gets it right. While the economy still goes through up and down cycles, over the long run, the economy (the straight, dotted line) generally moves up. By smoothing out the boom-and-bust “cycle,” smart governments make the economy more predictable, make advance planning more realistic, prevent a lot of dumb gambles and painful bankruptcies, and generally help the economy to grow more over a long period of time. Most Presidents since World War II, including Republicans Eisenhower and Nixon, and Democrats Kennedy and Johnson also did this. President Eisenhower, for example, started building the very expensive Interstate Highway System as a way of getting the economy out of recession in the 1950’s. Presidents Reagan, the first Bush and Clinton also generally understood the rules. One exception: President George W. Bush, who took office in 2001, when the economy was already growing fast – and then stimulated the economy still further by increasing spending to pay for wars in Iraq and Afghanistan (while also cutting taxes, another way of increasing private spending). This dangerous spending increase in an already hot economy encouraged the excessive risk-taking in the financial sector that resulted in the economic crash at the end of his term. Another example of how these ideas really work? Just look at what happened after the financial crisis of 2008. The governments of the European Community did NOT follow the U.S. example of stimulating the economy (increasing spending) following the collapse of Wall Street banks around 2008. Instead, led by Germany, they cut spending during the recession. They prescribed austerity, instead of stimulus. What was the result of these opposite policies in the U.S. and Europe? Europe is still struggling to recover from the recession, while the U.S. is well out of it, and into another period of growth. In effect, the world just tried a big experiment as to which government policy – stimulus or austerity – works best in a recession. And the U.S. was right. Newspapers recently are reporting that Europe has recognized its mistake. The European central bank is starting do what the U.S. Federal Reserve did seven years ago. They have begun to encourage borrowing and spending more money (except for Greece, unfortunately) – and if what you have read here is right, Europe will now complete its economic recovery. In the next recession, let’s hope they get it right the first time. This entry was written by Carl Proper, posted on May 14, 2015 at 3:56 pm, filed under Economy. Bookmark the permalink. Follow any comments here with the RSS feed for this post. Post a comment or leave a trackback: Trackback URL.